Why live with unwanted hair? 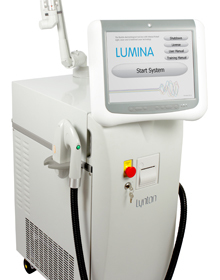 At the Bournemouth Laser & Skincare Clinic, we offer LUMINA (Intense Pulsed Light) treatments which offer a safe, long-term solution to unwanted, excess hair for both men and women. moved to the neighbouring area of skin and the process is repeated until the entire area is treated. concentration of melanin. Fair hair however, contains less melanin and is harder to treat. We recommend a consultation with your clinician to ascertain if the treatment will be successful for you. Grey/white hair has no melanin so is not suitable for treatment. Treatment sensation varies but is often described as “a flick of an elastic band”. hairs shed after 1 – 3 weeks as the epidermis renews. During this period the hairs will seem to ‘grow’ as they are pushed out by the new epidermis. swollen and bumpy but this usually subsides within a few hours. Adverse reactions are rare but may include a small blister or temporary lightening or darkening of the skin.